Cracked bastion. Lino-cut, 15x20cm, 2017. 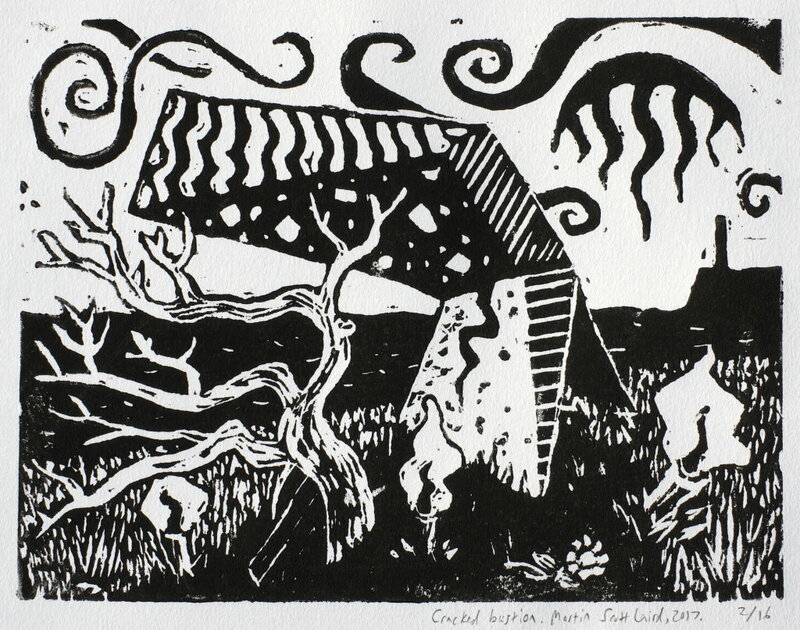 Cracked bastion is a lino-cut print inspired by the ruined wartime fortifications and twisted, wind-blasted trees which can be found throughout Orkney. This print will be on display (and for sale) in the Christmas open exhibition at the Pier Arts Centre in Stromness, from the 18th of November to the 23rd of December, 2017. Someone else’s head. Screen print, 70x54cm, 2017. 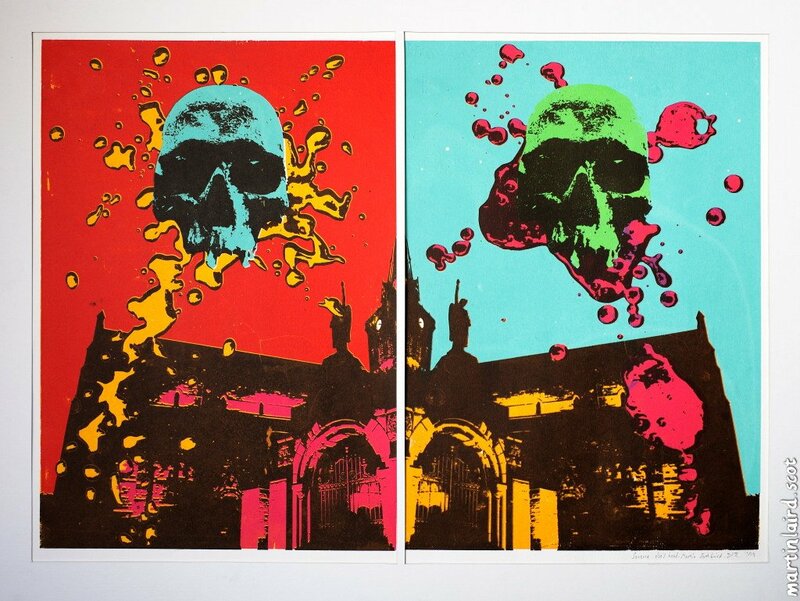 Someone else’s head is a screen print of St. Magnus Cathedral in Kirkwall, Orkney. It is in two halves, which are partially mirrored but not the same. Each half contains one colour that the other does not. St. Magnus Cathedral is juxtaposed with a neolithic skull and paint splatters. The meaning of this is open to interpretation. 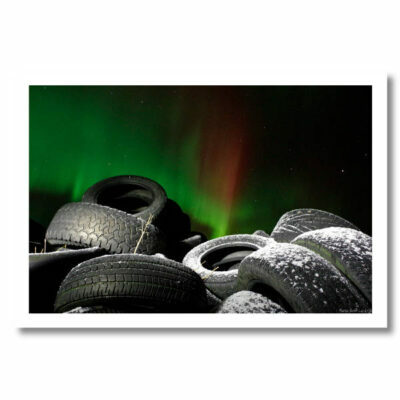 The print run consisted of 19 limited edition prints in total. Someone else’s head is on display, framed and for sale, in the Old Library in Kirkwall, until Christmas. Starling with stars, 2017. Lino-cut print. 155x200mm. 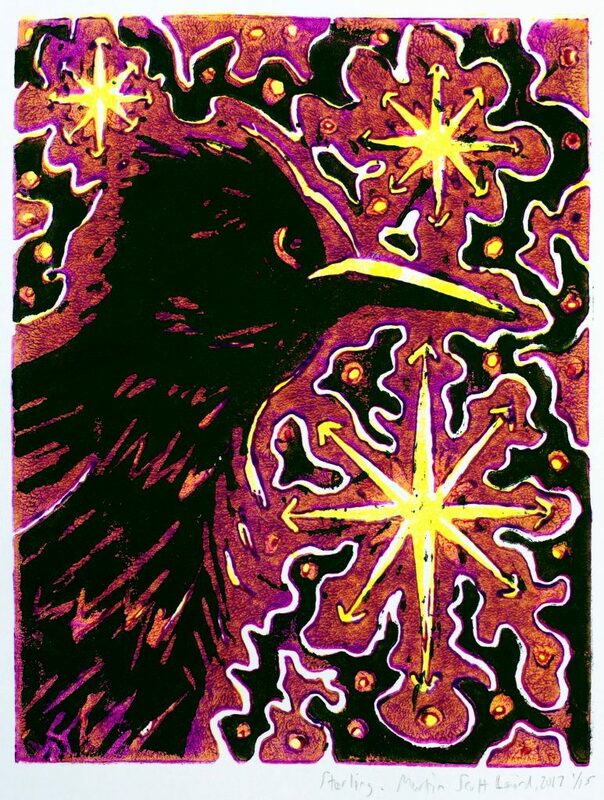 This starling with stars is the first lino-cut I have made for a very long time. It is rough and scrappy, but to an extent that may be acceptable as I intended the image to be chaotic. The starling is a very common bird in Orkney, and quite beautiful in its own subtle way. The print was made using a block-printing medium mixed with acrylic paint, which turned out to be far less opaque than I had hoped. As a result the colours are nowhere close to what was originally envisioned. I applied too much ink to the roller in an effort to compensate for the transparency, which only resulted in a messier print! In a lino-cut reduction process, each layer is printed and then lino cut away for the next colour. This means the print can never be replicated.